Eli Roth’s The House with a Clock in Its Walls, despite being a straight-up kids movie with a release date in the dead of September, was one of my most anticipated films of the fall if not of the entire year. Despite the obvious warning signs though, I think it’s actually pretty easy to see why this was the case. First, there is Jack Black who has done well to understand the current phase of his career; with last year's Jumanji sequel as well as Goosebumps he is slowly establishing himself as the guy that will be fondly remembered by the tweens and younger teens of the current generation as that funny guy who was in all of their favorite movies. Better even, when those same kids get older they can go back and discover more of Black's rather impressive collection of work. Another encouraging factor going in was the fact this was a kids movie with Cate freakin' Blanchett in it. Now, Blanchett has been doing more work in more commercially viable popcorn flicks as of late with the last Thor film and Ocean's 8, but it seemed it would take a really great script or great character to really entice an actor of her caliber. Blanchett certainly seems to be having a great time exploring the genre, but unfortunately she doesn’t have nearly as much to do as one would expect sans the excellent bickering back and forth between her and Black. This cast, this genre, this time of year...what more could there be that might help propel this project to the heights it seemed so obviously destined to reach? I say this somewhat ironically as it seems most critics and audiences didn't expect much from another kid-centric Black film-especially one based on a children's book from the seventies and especially not one directed by the guy who made 2018's Death Wish, but alas...here we are. As someone who has always adored Black's range and versatility there was this sense of optimism and support, but the point of concern was always Roth. Roth is a director raised on the Amblin films that are very clearly an inspiration for his The House with a Clock in Its Walls, but unfortunately Roth's homage to spooky if not exactly scary kids fare doesn't pass that test of being a magical film about magical people. The finished product can certainly be endearing for long stretches, but the big picture never gels and is more a hodge-podge of several different "chosen one" archetypes than it is a single, focused, satisfying narrative. 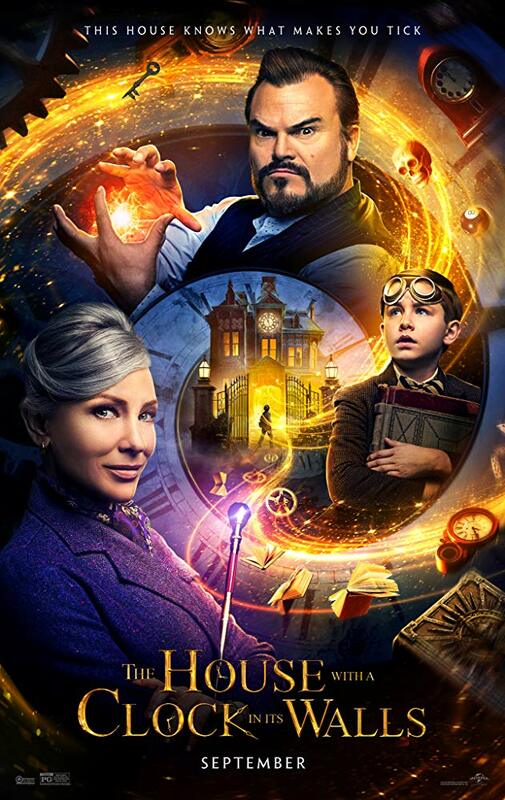 And though The House with a Clock in Its Walls proved to be more disappointing than hoped for it’s not impossible to see how the film might become more appealing over time-especially to the generation that will grow up on it. Young, orphaned Lewis (Owen Vaccaro) comes to live with his Uncle in a mysterious house, with a mysterious clock. Based on John Bellairs' 1973 novel of the same name, The House with a Clock in Its Walls follows the recently orphaned Lewis Barnavelt (Daddy's Home's Owen Vaccaro) who is sent to Michigan in the fall of 1955 to live with his estranged as well as outright strange, uncle Jonathan (Black). Lewis quickly discovers his uncle is a warlock AKA a boy witch and that his uncle's quirky neighbor, Florence Zimmerman (Blanchett), is a witch in her own right. Further, Lewis discovers both are guarding secrets concerning the house Jonathan has just invited young Lewis to live in with him. Much to Jonathan's surprise, Lewis is something of a bookworm and a rather engaging child who is more than thrilled to enter this world of magic and sorcery where. Lewis begins to learn from his uncle as well as Ms. Zimmerman and the trio form something of a comfortable family unit. As Lewis learns the ins and outs of magic spells and ancient curses he also has to balance this peculiar existence with trying to fit in at a new school and make friends. Class president and all-around popular kid, Tarby Corrigan (Sunny Suljic, the star of Jonah Hill's upcoming mid90's), quickly takes to being kind to the admittedly odd Lewis, but it's easy for everyone but Lewis to see Tarby has ulterior motives. And though Jonathan and Ms. Zimmerman seem to be enjoying their time with Lewis, teaching him their ways as well as poker while keeping him on a steady diet of cookies there is the ever-lurking evil of the hidden clock in the house's walls that seems to be counting down to something, but to what-neither can figure out. Besides the whole orphan deal, this is where the tropes really begin to pile-up as Jonathan possesses a book of spells that is off-limits to Lewis (his one and only rule in the house), but in order to prove he's cool and convince Tarby magic is in fact real Lewis goes to the lengths of stealing the forbidden book and bringing an evil wizard named Isaac Izard (Kyle MacLachlan) back to life. As these things go, Izard has a history with Jonathan along with an evil plan that may or may not, but obviously does deal with the magical clock hidden within the walls of the house, counting down to whatever it might be that is certainly anything but good. And so, Lewis, his uncle Jonathan, and Ms. Zimmerman must find the clock before it's too late, but must each overcome their own insecurities and histories along the way. The fact Eli Roth was taking a spin with a different target audience was always the main concern here, as I said before. Sure, it may have been more a point of intrigue than an outright curiosity given we've seen the guy can make a solid horror flick, but the test was going to be if he could manage those same tendencies adjusted for a younger crowd. And just to clarify, in case you're unsure-yes, that would be the Eli Roth who made Cabin Fever, both Hostel movies, and who starred in Inglorious Basterds as "The Bear Jew"...yeah, remember that scene? Needless to say, my hope was that with Roth's sensibilities, if he was able to balance them well, he would be able to keep the film appropriately scary while injecting an underlying quality of sincere terror. Point being, this had all the ingredients of a movie aimed at kids that also seemed as if it could become a Halloween staple, but while Roth certainly pushes the envelope in terms of content a PG audience can handle the movie itself never manages to find its groove well enough to hammer any of these scares home. One of the biggest identifiers of those eighties Amblin movies was that, as children who might relate, the characters and their environment would become so ingrained in the viewers that watching the movie would feel akin to traveling somewhere that felt like a home away from home. The story would become so familiar, the characters so reliable, and the jokes would forever remain funny to the point the movie became this safe haven of sorts and while this may become true of The House with a Clock in Its Walls over time or with repeated viewings what came to be the biggest mark against the film after a first, initial viewing is the fact its atmosphere possessed no such welcoming signs. This isn't because it doesn't try-Roth and his practical set designers do well to create this period in 1955 that is adorned with magical oddities and big, ornate houses on abandoned, leaf-covered streets, but while the physical representations of this atmosphere are available in plain sight Roth doesn't meld these sets with the narrative in a strong enough way that they come to mean anything more than where the action takes place. As it is, the action could have taken place anywhere, but what the audience needed was for the action to take place in this titular house because it couldn't possibly take place anywhere else. Unfortunately, as the story never comes to be conveyed in any clear or resonant way the place in which it all occurs remains just as much a mystery as well. Jonathan (Jack Black) and Ms. Zimmerman (Cate Blanchett) are neighbors and fellow magicians in The House with a Clock in its Walls. Not being able to replicate this sense of familiarity or pose this sense of cautionary greetings to this world deliver some hard strikes against The House with a Clock in Its Walls, but while Roth is unable to ever make his movie feel as if it really gets going or give it the real jump start it needs one might hope that given the talent he has employed they could make up for the director's shortcomings. As is shown on the screen though, both Black and Blanchett aren't given enough character to play with to create something that is either wholly endearing or even memorable. Both actors certainly do what they can with the material (Bellairs novel was adapted by Eric Kripke, a veteran of TV writing, but who only has a couple of feature credits to his name), but while uncle Jonathan has peculiarities galore and while Black plays up each of them as much as he can more times than not the character feels as if he exists solely to deliver a punchline that allows Roth to cut to his next scene rather than a core character who has a dog in the fight. It should be Jonathan who has the biggest dog in the fight though, given his history with Izard, our main antagonist, but rather than delving into the past relationship between Jonathan and Izard and how the turn to dark magic came for one and not the other Roth decides to gloss over much of this fertile drama for quick flashbacks that blame it on WWII and a demon in the woods offering a reprieve from such horrors while tempting Izard with a bigger solution. This more serves to justify Izard's actions rather than his entire change in character, but The House with a Clock in Its Walls doesn't give much credence to such thoughts and instead turns its focus on young Lewis who is obviously brought into the fold at the time he is for reasons beyond anyone's control and to the grievance of Jonathan and Ms. Zimmerman who likely hoped for a more logical way to deal with their clock problem. While it's clear Lewis is being set-up and then groomed to be this "chosen one" that rescues everyone from the antithesis of the pure-intentioned warlock he's becoming it's never really clear why this is the case outside of the fact he's Jonathan's nephew. What actually makes Lewis so special? There is no connective string, no throughline theme, no epiphany that the characters come to that brings a clarity to them or the audience. Instead, Roth simply hits the beats of the genre in a competent enough fashion that the viewer understands the good guys win and the bad guys lost. This might have sufficed for any other straight-up kids movie released in the dead of September, but there is so much obvious potential here it's a shame a more adept director with a clearer vision wasn't able to welcome audiences into this house with a clock in its walls.